Hibiscus is a flowering plant native to subtropical and tropical regions throughout the world. The plant is recognized by its large and often colorful five-petal blossoms. In addition to brightening a garden landscape, certain species are used for making food, tea, and folk medicine. Chief among them is a species known as Hibiscus sabdariffa, the flowers of which are rich in phytonutrients and antioxidants like vitamin C.
Also known as roselle, H. sabdariffa is harvested when its blossoms have yet to open. The buds, referred to as calyces, are deep red in color (as opposed to the blossoms themselves, which are white). The calyces are typically dried and used to make teas and syrups or added as an ingredient to traditional Indian, Southeast Asian, and West African dishes. Hibiscus has a characteristically tart, floral floral flavor and little scent. Hibiscus' use in medicine can be traced back to ancient Egypt when it was believed to reduce fever and treat heart and nerve disorders. Its use in treating these and other medical conditions persists today, although many of the claims remain unsupported by research. Hibiscus is known as guai shu shu in traditional Chinese medicine. The plant is also referred to as belchanda in Nepal, sorrel in parts of the Caribbean, gra jiap in Thailand, chin baung in Burma, and gonguru in parts of India. In addition to hibiscus teas found in most grocery stores, hibiscus supplements are available in capsule, tincture, and powder forms. Drinking hibiscus tea may benefit people with hypertension (high blood pressure), according to a 2015 review of studies published in the Journal of Hypertension. The researchers from Australia, Iran, and Romania evaluated five previously published trials involving 390 people, 225 who were given an H. sabdariffa and 165 who were provided a placebo. 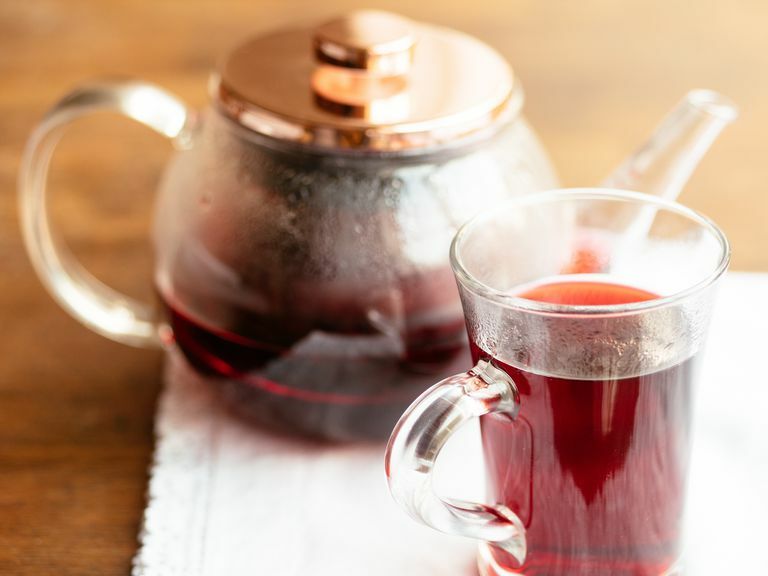 In tallying the results, the investigators concluded that the daily use of hibiscus tea reduced the systolic blood pressure by an average of 7.5 mmHg and the diastolic blood pressure by an average of 3.53 mmHg. Despite the positive findings, the scientists concluded that the quality of the studies was mixed and that "further well-designed trials" would be needed to validate the results. Hibiscus tea may help people with type 2 diabetes better control their blood glucose (sugar). Much the current evidence is based on animal research, including a 2013 study published in Pharmacognosy Research in which an injected extract of H. sabdariffa reduced the blood glucose in rats by 12 percent. Interestingly, normal rats injected with the same extract experienced no change in their glucose levels. Another issue facing people with diabetes is the impact the disease has on blood lipid (fat) levels. Diabetics tend to have less "good" cholesterol and more "bad" cholesterol in their blood, both of which increase the risk of heart disease and stroke. In a 2009 study published in the Journal of Alternative and Complementary Medicine, researchers provided the 60 people with diabetes either hibiscus tea or black tea to drink twice daily for 30 days. Of the 53 people who completed the study, those in the hibiscus arm had a significant increase in "good" high-density lipoprotein (HDL) cholesterol and decreases in "bad" low-density lipoprotein (LDL) cholesterol compared to the black tea arm. Total cholesterol and triglyceride levels were also consistently lowered. In an associated study published in the Journal of Human Hypertension, hibiscus tea was shown to reduce the systolic blood pressure in people with type 2 diabetes by an average of 9.3 mmHg but not the diastolic blood pressure. Although hibiscus tea is commonly lauded for its ability to treat hypercholesterolemia (high cholesterol), a 2013 review published in the Journal of Ethnopharmacology suggests that it may not be all that helpful. In evaluating six previously published studies involving 474 people with hypercholesterolemia, researchers in Malaysia were unable to find any association between H. sabdariffa and improvements in blood lipid levels. While this may seem contradictory when compared to the previous studies involving diabetics, it suggests that the improvements in cholesterol were secondary to the glucose-lowering effects of hibiscus. In people without diabetes, whose blood sugar is unaffected by hibiscus, there appears to be no benefit. Hibiscus tea is generally considered safe with few side effects. Problems, if any, tend to occur with the excessive use of hibiscus supplements. If overused, hibiscus capsules, tinctures, and powder may cause stomach pain, gas, constipation, nausea, painful urination, headache, and ringing in the ears (tinnitus). Even the overconsumption of hibiscus tea may cause transient dizziness and fatigue due to its effect on blood pressure. Like other herbal teas, hibiscus tea may interfere with certain medications. These include antihypertensive drugs in which the coadministration of hibiscus may cause hypotension (low blood pressure). Similarly, the combination of high-dose hibiscus supplements and diabetes medications could potentially lead to hypoglycemia (low blood sugar). Hibiscus also contains phytoestrogen, plant-based compounds that are similar to human estrogen. While the occasional cup of hibiscus tea will unlikely do you any harm if you are on the pill, the regular use of hibiscus can potentially undermine the effectiveness of estrogen-based birth control. Always speak with your doctor before embarking on any home remedy, including something as innocuous as hibiscus tea. Doing so may help you avoid interactions and side effects. There are no guidelines directing the appropriate use of hibiscus supplements. Most capsule formulations are offered in 250-milligram to 400-milligram doses and are considered safe if used within this range. Dried hibiscus flowers or powders, found online and in some health food stores, can be used to make hibiscus tea and syrups. Hibiscus tea can be made by steeping 1.25 grams (1.5 teaspoons) of dried hibiscus to 150 milliliters (3/4 cup) of boiling water for five to 10 minutes. When used for medicinal purposes, limit yourself to no more than two to three cups per day. Because dietary supplements are not strictly regulated in the United States, always choose those produced by a reputable manufacturer with an established brand presence. If buying dried hibiscus flowers, only choose those that have been certified organic under the regulations of the U.S. Department of Agriculture (USDA). As a general rule, be wary of imported remedies made with hibiscus. As much as you may believe them to be more "natural," it is impossible to know whether they have been exposed to pesticides, chemical desiccants, or other contaminants. If buying hibiscus for medicinal purposes, be sure that Hibiscus sabdariffa is printed clearly on the product label. Other species used for medicine include Hibiscus rosa-sinensis used in certain Ayurvedic remedies and Hibiscus taiwanese from Taiwan. Are all hibiscus plants safe for consumption? Hibiscus plants are classified as toxicity category 4. This means that the plant and its blossoms are considered nontoxic to humans. This shouldn't suggest that you can go out and eat any blossom you see. Be sure that the plants have not been exposed to pesticides or insecticidal soaps. Dried hibiscus petals intended for potpourri should not be eaten. Certain hibiscus species are poisonous to dogs, most especially the hardy hibiscus (Hibiscus syriacus), also known as the Rose of Sharon. If eaten, a compound known as asparagine can cause vomiting, diarrhea, loss of appetite, and oral blistering in dogs. It is unknown whether H. sabdariffa may also be toxic to canines. Aziz, Z.; Wong, S.; and Chong, N. Effects of Hibiscus sabdariffa L. on serum lipids: a systematic review and meta-analysis. J Ethnopharmacol. 2013 Nov 25;150(2):442-50. DOI: 10.1016/j.jep.2013.09.042. Mozaffari-Khosravi, H.; Jalali-Khanabadi, B.; Afkhami-Ardekani, M. et al. The effects of sour tea (Hibiscus sabdariffa) on hypertension in patients with type II diabetes. J Hum Hypertens. 2009 Jan;23(1):48-54. DOI: 10.1038/jhh.2008.100. Mozaffari-Khosravi, H.; Jalali-Khanabadi, B.; Afkhami-Ardekani, M. et al. Effects of sour tea (Hibiscus sabdariffa) on lipid profile and lipoproteins in patients with type II diabetes. J Altern Complement Med. 2009 Aug;15(8):899-903. DOI: 10.1089/acm.2008.0540. Serban, C.; Sahebkar, A.; Ursoniu, S. et al. Effect of sour tea (Hibiscus sabdariffa L.) on arterial hypertension: a systematic review and meta-analysis of randomized controlled trials. J Hypertens. 2015 Jun;33(6):1119-27. DOI: 10.1097/HJH.0000000000000585. Wahabi HA, Alansary LA, Al-Sabban AH, Glasziuo P. The effectiveness of Hibiscus sabdariffa in the treatment of hypertension: a systematic review. Phytomedicine. 2010 Feb;17(2):83-6. Wisetmuen, E.; Pannangpetch, P.; Kongyingyoes, B. et al. Insulin secretion enhancing activity of roselle calyx extract in normal and streptozotocin-induced diabetic rats. Pharmacognosy Res. 2013 Apr-Jun; 5(2): 65–70. DOI: 10.4103/0974-8490.110520.